Watch video flash briefings, Amazon Video, see music lyrics, security cameras, photos, weather forecasts, to-do and shopping lists, browse and listen to Audible audiobooks, and more. All hands-free - just ask. 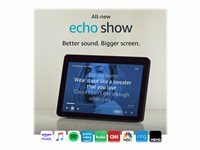 Make hands-free video calls to friends and family who have an Echo Show or the Alexa App, and make voice calls to anyone who has an Echo device or the Alexa App. Play your music simultaneously across multiple Echo devices in separate rooms with multi-room music.